The euro vs dollar continued its upwards path much as expected yesterday, ending the trading session as a wide spread up candle which closed marginally below our initial target of 1.50, and with small shadows to both top and bottom of the candle. 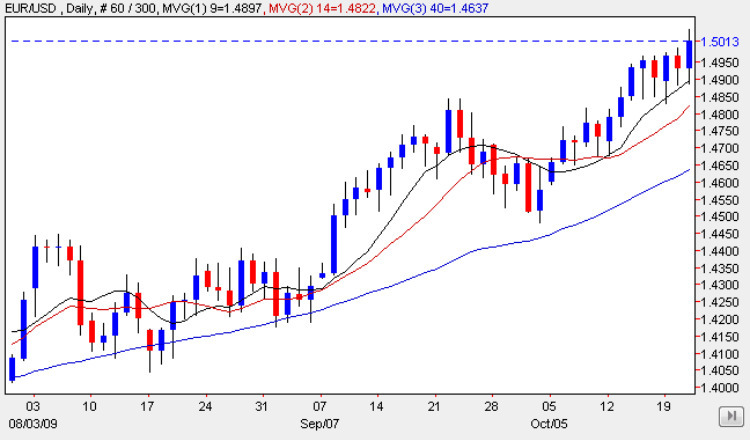 The strength of this rally was further confirmed yesterday by the low of the day which once again found strong support from the 9 day moving average indicating that this move has some way top go yet and 1.55 seems to be the next likely pause point for the the euro vs dollar pair. With all three moving averages pointing higher, and with a strong platform below there is only one way to trade this pair at present and that is to the long side, all helped of course by a chronically weak US dollar, a position that seems likely to continue for some time to come. The change in sentiment for the US dollar will only come once the FED signal an interest rate rise, which at present seems a very long way off, given the current crop of fundamental news. There have only been second tier items of fundamental news on the economic calendar for Europe where we had the current account numbers which came in at -1.3b against a forecast of 1.9b. This is a very interesting piece of data as it is directly linked to currency demand – a rising surplus indicating that foreigners are buying more of the domestic currency. This was released in tandem with Italian Retail sales which came in at -0.1% marginally worse than expected. Meanwhile in the US the most important item of data was the unemployment claims which came in worse than expected at 531k against a forecast of 516k indicating that the labour market will be slow to recover with economists now predicting that the unemployment rate could rise to 10% by the first quarter of 2010, thereby jeopordizing any recovery in consumer spending. This dismal scenario is likely to keep the dollar under severe pressure. Other items of news have been the CB Leading Index which came in better than forecast at 1.0% versus a forecast of 0.9%, HPI which came in at -0.3% instead of 0.3%. Finally later this evening we have another clutch of FED Members speaking at a variety of venues. You can find further details as well as all the latest fundamental news on the economic calendar, latest currency news and live currency charts by simply following the links. I have also included details on an excellent ECN broker.